M-Cube Digital Engagement, Italian leader in the creation of audio-visual and interactive in-store marketing solutions for major retail and fashion brands, continues its international expansion with the acquisition of important French company Carlipa, which has over 12,000 sales points and more than 100 clients around the world. Milano, 18 February 2019 – M-Cube Digital Engagement has concluded a further operation as part of a plan for growth that began with the recent acquisition of start-up Stentle. The French branch of the group, M-Cube France Digital Engagement, has purchased 100% of Carlipa, an important French digital signage and multimedia communication solutions company based in Paris. The company run by Anthony Verdureau (CEO) was founded in 2002 and soon became a French leader in in-store communication. With a similar growth pattern to M-Cube, today it manages 12,000 stores around the world for over 100 clients including major groups in the fashion & luxury world such as Louis Vuitton, Dior Couture, Richemont La Vallèe, Maison du Monde, Lacoste, Monoprix and Orpi among others. The purchase of Carlipa is extremely strategic for M-Cube, allowing the company to expand its fashion & luxury client portfolio into the French market and inherit Carlipa’s operational branches in Shanghai and Hong Kong. 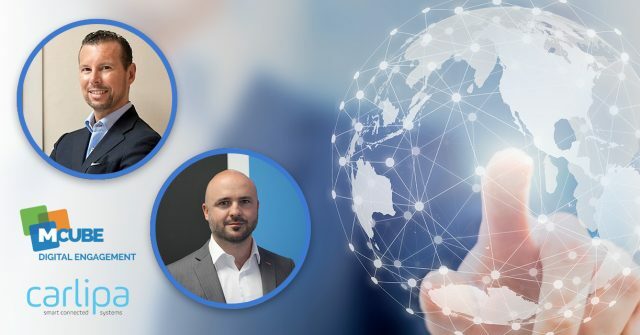 Becoming part of the M-Cube group is a great opportunity for our company: we strongly believe that this operation will reinforce our growth on the market and allow us to offer even better services to our customers. I am very enthusiastic about the idea of writing a successful story with the M-Cube group and positioning our company as a market leader over the coming years. We are extremely satisfied with this operation with which we have achieved three objectives. These were to strengthen our international structure through a merger with a historic market leader with direct subsidiaries in Asia; to increase our potential thanks to the important software department established over years of development by Carlipa, with particular focus on the customer experience; and to add important clients to our portfolio, particularly luxury sector brands in line with the main M-Cube Group vocation.